If you have not read the TT report yet, here is their blog and link to the report. Recent evidence from Canada states that food insecure adults are more vulnerable to chronic health conditions – conditions that require a good diet and care to stave off illness. Without doubt the same applies here – hence the need to feed hungry people well, hence the need to change the current food aid system to feed people good food. The long-awaited TT nutritional report was published last week. An opportunity for the TT to show themselves as an organisation that care about what people eat when they are hungry. Instead, it was a study/report set up to do nothing more than convince others that the current food aid parcel is nutritious and therefore ok to push onto hungry people. It was an exercise in trying to protect their poor-food model as opposed to using their now considerable resources to plot a sustainable course to feeding people well. The headline claim is the food aid parcel is ‘nutritiously-adequate’ – REALLY! … let’s take a look at this claim and in particular the method deployed by the Academics who according to their biogs are ‘food experts’. Upfront and clear throughout the report and the adjoining blog on the TT website written to promote it was to try to protect their existing food parcel and steer away from improving the quality of the food for hungry people. This was well supported by a particularly narrow and therefore weak methodology set up by the academics. A methodology which was about subjectivity throughout, suiting the TT purpose rather than setting out a clear case and objective look at how people need to be fed. A quick glance at the references in the report tells every reader the study was narrow and set up to prove the point that the food aid package is nutritional – which it categorically is not – more of this later. The title of this blog is a ‘Missed Opportunity’ and here is why. The TT have the resources to change the food offer if they wish and there is the knowledge in the food aid system to deliver that change. But instead, their aim was to try and substantiate their previous claims that the parcel is nutritious. So, 10 years into using a poor-food-for-poor-people model, they set out to steadfastly defend rather than amend and when something is wrong and that is the starting point, poor work follows. It could have been so different. The authors (academics) claim this to be nutritional and also claim that the parcel above is able to feed a person adequately for up to 5/6 days. We challenge anyone to find 3 days-worth of meals in the above package so let your imagination run wild and find 5/6 days = not possible, not credible. And each item loaded with sugar and that’s without any focus on the sugar in desserts – yet taking out bags of sugar will clearly make everything better – more of this later. In an aim to provide a ‘robust’ case… the authors chose to ignore the family, concentrating only on single people. With such a gap in the method how can a claim of ‘nutritionally-adequate be applied? The report claims… the parcel is nutritionally balanced if the hungry person eats everything in the parcel? We know that never happens, because and about 45% of the parcel remains uneaten as it cannot be eaten as meals. A glaring omission by the authors – strip out 45% and let’s see the analysis then? The report does not… take account of dietary needs, vegetarianism etc – and the impact the parcel has on people requiring a specific diet – no analysis here at all? The report overlooks… where this so-called nutrition comes from = ultra-processed foods. Foods that are known to damage a person’s health – food that should never play any part in feeding a hungry person. Of course, the claim of the authors and TT is it’s a package only for emergencies – this is nonsense and it only serves to reinforce poor food habits that no public health advice would sign up to. The report overlooks…the need for fibre in a person’s diet and there is no mention of fibre anywhere in the report – an omission or deemed not relevant by the authors? Either would indicate a mistake that strips away another level of the nutritionally-adequate claim. The report does not reflect… on the needs of children and how children are forced via the food bank parcel to eat ultra-processed adult foodstuffs. The report claims the food items being eaten in a balanced way… without the density of eating whilst hungry for example, eating… tinned pies, followed by hot dogs, followed by another tinned meat dish – because that what people do/select when they are hungry – stuff themselves with savoury high fat salt and sugar stuff. And yes, this is what happens when people are hungry and any claim otherwise is spurious. The report, and let’s use the authors own words here…says, ‘Whilst the sum of the food items in the parcels were nutritionally adequate (with the exception of sugar, salt and Vitamin D)… Here we have analysis that states a food bank parcel is high in salt, very high in sugar and lacks vitamin D = too much salt and sugar, both on the ‘killer-food’ watchlist by the way and needing vitamin D; you know the very vitamin that stops rickets, protects teeth etc – and with all this is going on and the parcel is still ‘nutritionally-adequate’ – don’t think so. The report says it’s ok for poor people to eat in an abnormal way. A way nobody was brought up to eat in. That is to eat products over meals. Go back to the picture and what the TT and authors are saying is ‘we know the food parcel doesn’t consist of meal options – but hey, your poor so eat poor products instead. What is outrageous about this outcome is the report has been compiled by ‘food experts’ and signed off by the TT Management Team – clearly both parties think forcing people to eat products over meals is the right thing to do. And using this as a very clear and appropriate benchmark, this point alone completely removes the report as a credible piece of research. So how has all this been dressed up to read as if there is something credible to be found? The TT have done their usual pretending that this is another nutritional report in a series they have produced. Anyone who takes an interest in this subject knows this is the first report, pushed out because of the noise that agencies like us are making. It’s all about trying to protect their service offer and nothing in the report or the subsequent TT actions shouts ‘we are wanting to feed people well’. The food aid package remains as it is with one major change – the removal of a bag of sugar. Yes, the headline change is the removal of the bag of sugar and hungry people will now of course be much better off. You couldn’t make this up. All the resource they have put into the report and build up the TT have given it and A BAG OF SUGAR becomes the major change item. If the intention was to feed people well, this is the most important piece of the report but it was never the intention and so it did become a recommendation by the authors = No. And do the TT intend to do anything about it = No. Never mind, everything is now fine, because those poor hungry people can’t get their hands on a bag of sugar. As already noted – you couldn’t make this up. Of course, we do not know what their brief was, but it is fair to expect researchers to present a robust case when expecting people to legitimately accept the finding of a report that is supposed to be about feeding people better when they are in crisis. What is damming about the academics approach is they chose, after 10 years of poor-food-supply by the TT, to ignore the human case and simply use software to apply their bias, and it is a bias, given the human factor was ignored. Put simply, there is no reflection on how people eat or do not eat the food aid package and that is a glaring miss for people who introduce themselves as having a food expertise. They have assumed that the whole food package is eaten when that does not happen – they have analysed products over meals – when in fact they accept people eat meals over products (see above). And although they noted this as a concern, it does not appear as a headline recommendation…clearly demonstrating that it was research to protect service over people, so crisis over care. It’s a miss and such a glaring miss that it negates the whole study. Throughout the report a number of other things stand out. 1 – The authors repetition of well-rehearsed TT lines. Written as if it was the TT themselves putting up their already well-worn defence; a defence that rolls out if any perceived criticism is made. It indicates that the authors know very little about how the food aid system works or how people engage with the system as donors or use the system when hungry. We found this quite surprising given one of the authors has been working at a food bank as part of their PHD? About the references: Take a look, it’s a reference list to suit the end result not to apply objectivity or steer towards any sort of alternative outcome – after all, the TT are the client. To finish – here we go again… the TT seemingly happy with the report results – a report that satisfies them with the term ‘nutritionally-adequate’. No doubt the TT will push it out to their food banks as if it adds some sort of credibility to their food work. – it doesn’t. Agreeing to the reports findings also indicates that there is no food expertise within the Trussell Trust – their skills are in franchise management, logistics and PR – yet they want to be trusted with people’s diet and wellbeing? The food parcel is not nutritious and look into the report itself and its says so. Anything that is high in salt, very high in sugar, lacks Vitamin D and requires people to eat products over meals, is not nutritious and you don’t need to be a food expert to identify with that. Oh, and don’t forget, the glaring error made by the authors who assumed the whole parcel gets eaten – it doesn’t, far from it. In time, we are sure this report will be seen for what it is, a blatant attempt by the TT to justify an already discredited position of feeding people incredibly poor food. This was a chance to rectify a serious problem in the food aid system and treat people with the dignity they deserve. The TT have the resources to stop the problem but they chose not to and those close to the problem know why. 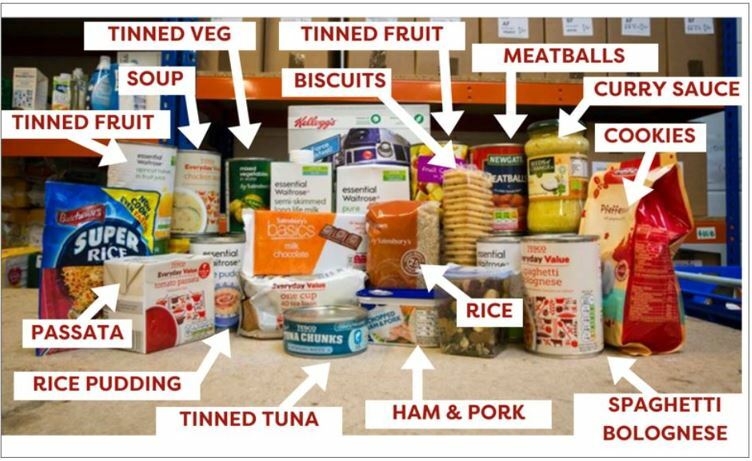 Now the report is published, we are left with a food bank service that is little more than a game of food-Russian-roulette for hungry people = containing pot luck products and some dangerous foodstuffs that most people would never choose for themselves. It is known that 8-10 hungry people do not use food banks because of the embarrassment and the poor quality of the food on offer – that means only 20% of hungry people approach food banks. Surely with the resources it now has, the TT would want to help create a good food aid system that encouraged the other 80% to use its services – evidently not. The report and TT ‘sugar action’ will do nothing improve this situation. Consequently, most hungry people will struggle and stay hungry outside of the food aid system and those who do enter into the food bank offer will continue to get fed badly. Last week, we were heartened to hear that a few key decision makers are now starting to listen to the very strong argument we have put forward that proves TT provide a poor-food offer to hungry people. We intend to use the report as further evidence that the TT have no intention of changing. Our campaign work continues and will do so until the TT feed people well. We commissioned a dietitian to report of the nutritional content of the TT Family package. Its supports the assessment that the package is high in salt and sugar but also notes the package becomes deficient in calories when applied to family eating. I’ve only just stumbled across your website and what you are offering looks great, but as someone who volunteers at a food bank, it does seem a particularly harsh comment on this report and with no suggestions as to any potential new routes to take. A lot of the time we are pretty disheartened to see the processed and unbalanced food that is donated but I can’t see that we can be fussy with what is accepted and handed out. As someone with a sustainable but simple way of life, with a reasonable household income, I try to create each meal for a lot less than £3.50, for 2 of us, and I can’t see that is an amount that someone else on minimal disposable income can afford on an ongoing basis. For someone with no spare finance, the food bank is a last resort and as much as everyone would love to supply and to receive a full balanced meal each day, it’s just not possible with the food donations. The donations that also have to have a good shelf life to make it into a sustainable service. I don’t pretend to know the ins and outs of the food bank in detail, but I would like to see suggestions of solutions added to anything criticising a service that is relied upon by a considerable amount of people who are grateful for it as the only option available to them. As a separate offering, your service looks great, and I’ll look more into it for sure, with the hope it builds. Maybe there can be an alternative to unbalanced food products in the end. Thanks for taking the time to respond – its an important conversation. To offer you the context of the blog. We have for 4 years tried to interest the Trussell Trust (TT) in designing a good food parcel for hungry people – and although we have met with them on numerous occasions, they have never shown any interest in doing so. For your interest, we have designed Good Food Bank and a Good Food Hub models and have designed a full service delivery that can ensure food banks are abler to stock and manage fresh meals and food – again TT have shown no interest?? Also in the same context we commissioned a Dietitians report into the food bank parcel (again 3 years ago) we shared this with TT with a view to working with them to improve the current food aid offer – instead they chose to conduct their own report, 3 years later, and as the title suggests the whole exercise became a ‘missed opportunity’ because rather than improve and work with others like us, the TT chose only to try and justify the current food aid package. We can assure you as a food business with considerable food expertise and dietitians working with us, the TT food aid package is not nutritious and the report is wrong to claim otherwise – it could be so different. To close, we have carried out 5 years of research and practice into the food aid system and we have approached it from the point of feeding people well. We have the model to do so but as we have said the TT do not want to make any changes. We have been very direct in our commentary about the TT because they have reneged on every commitment they have made to us – saying they wanted to work with us and then simply ignoring our work and our approaches therefore we have decided to make people like you aware of the problems and yes the solutions we have tried to feed into the system for the benefit of hungry people. For the record, there is no reason why any hungry person has to eat processed food only – this is a decision made by the TT. We hope people like you also ask questions of them too because up to now they have used a host of excuses to protect the poor-food-model and not one excuse stands up to scrutiny. Good luck Thanks for being involved in food aid – its so important – contact us again if you need further clarification? I’ve only just found out about Can Cook having been sent the link to the recent Guardian article by a friend. Your response to the Trussell Trust Report is brilliant – it absolutely nails the problems with the way their food banks operate and the contents of pre-packed parcels. I love all the things you are doing and the values you espouse – people in need of food deserve the best, not third rate processed food loaded with sugar. In Gateshead we have helped to set up a small weekly food co-op in the Bensham area which provides fresh veg, fruit along with staples, including herbs and spices to anyone in need who wishes to become a member. People choose what food they want and can use it as many times as they want. It is run by the members themselves. We’re a long way behind what Can Cook are doing but it is inspiring to know about you and to discover an organisation that is not afraid to constructively challenge the way some food banks are operating. Trussell Trust do not speak for everybody – there are many independent groups and you have spoken up for these. All the best with your great work.